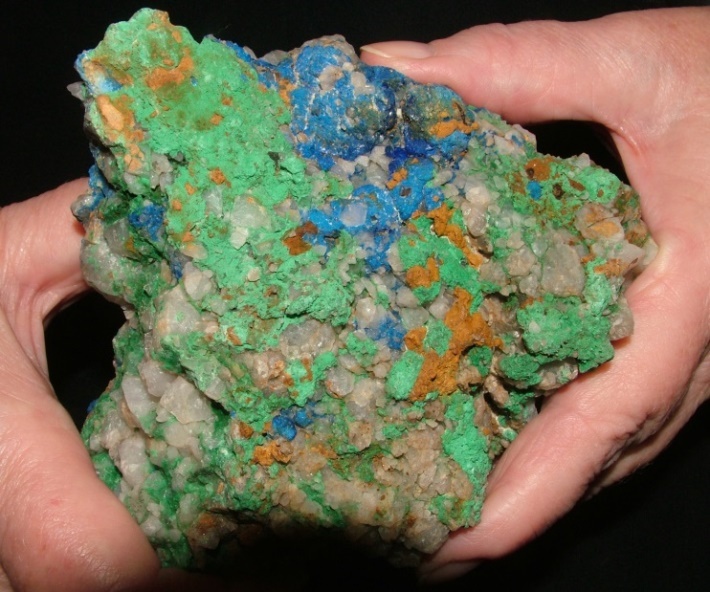 Copper mineralisation was discovered at Wheal Barton in 1846, approximately 2km east of the township of Truro. Mining commenced in 1849. The mine was worked on an intermittent basis until 1889 and more recently between 1956 and 1972 (“Truro the Travellers Rest 1838-1989” by Reg Munchenberg). Production records are incomplete and only document the production of 680t of ore at a grade of approximately 20% copper plus the production of an additional 93 tonnes of copper metal. Historical records indicated that there were nine shafts, with the main shaft bottoming at a depth of 90m. Incomplete plans of the underground workings accessible in 1967 are shown in Figure 1. Ore was mined from high grade copper bearing veins (example shown in Figure 2), typically 60 to120cm wide at an average grade of 20% copper. Figure 1: Wheal Barton Copper Mine – Plan, Longitudinal and transverse sections. Figure 2 Example of Wheal Barton high grade copper carbonate mineralisation. 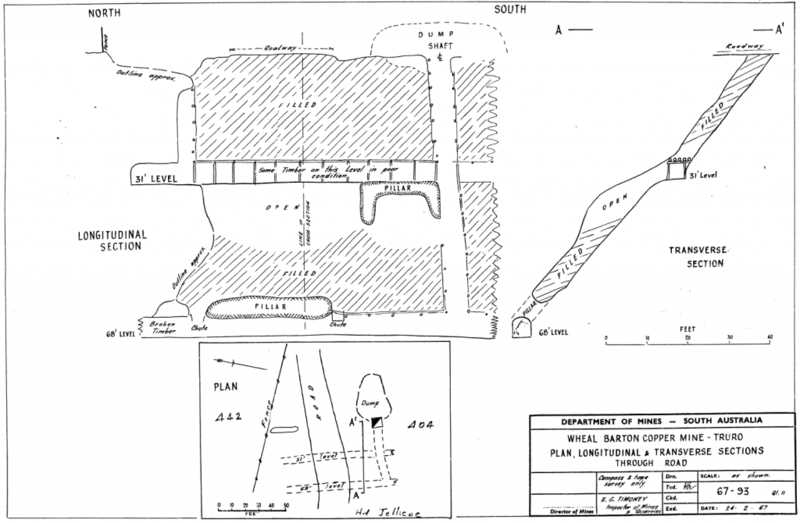 An investigation by SADME (now DSD) in 1942 indicated the presence of a 160m long main shoot and a 30m long south shoot, both of which had been worked to the water table about 30m below surface. Older reports described surface indications and shallow workings that extended for 350m circa 1900 but little evidence of these or of the nine recorded shafts are now visible. At surface all that remain of the mine infrastructure at Wheal Barton are the main vertical shaft, two auxiliary underlay shafts and an old winder house over the southern underlay shaft. Two hundred meters to the south there is a small open pit on the easterly side of a hill formed by the hanging wall sandstone (Figure 3 and Figure 4). Figure 3 Looking north from southern wall of the small open cut near geochemical survey line 6189600N (refer Figure 5). 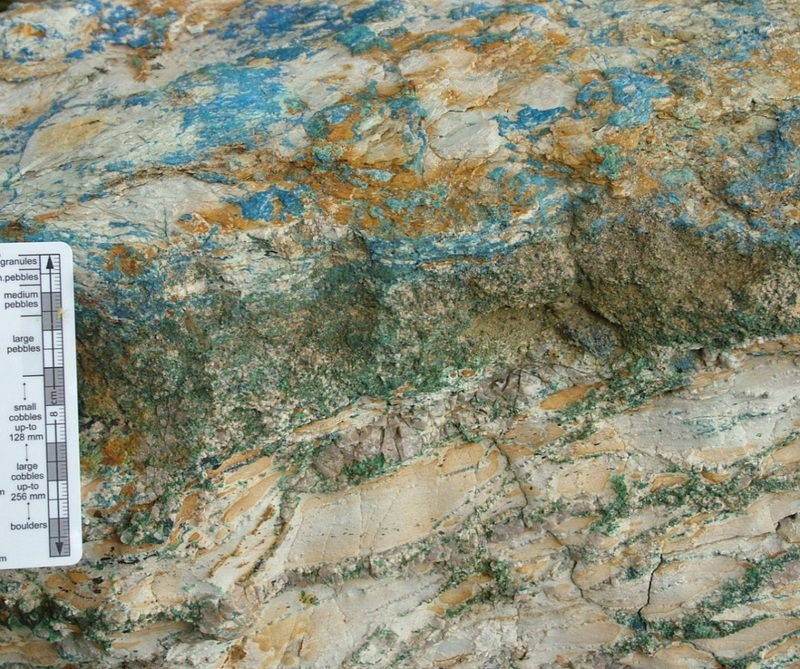 Figure 4 Quartz veining with copper carbonate in spoil at sample location 265568 (refer to Figure 1). Prior to Terramin’s work on the prospect, modern exploration activities at Wheal Barton had not progressed beyond the analysis of spoil from the historic workings. Three spoil samples from Wheal Barton collected by Silverdust Pty Ltd (Silverdust) in 1989 are shown on Figure 5 and an additional two spoil samples were collected by Eyre Resources NL (Eyre) in 1999 (no coordinates recorded). 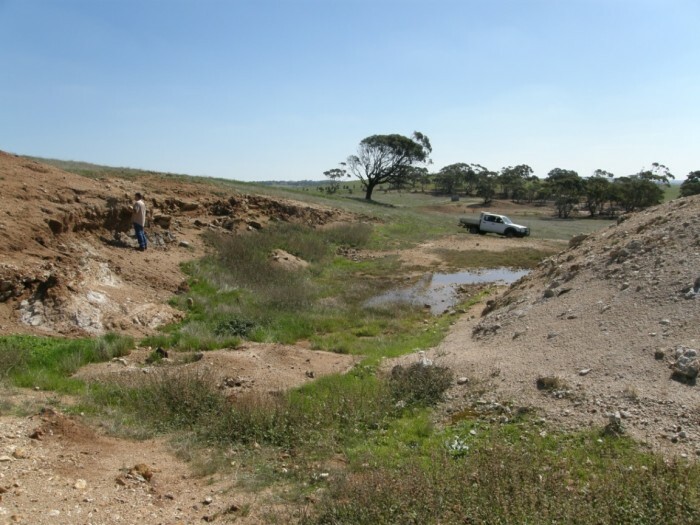 Wheal Barton copper mineralisation has not been tested by drilling, but 19 holes were drilled in the vicinity of the dam to determine whether the clay alteration in the footwall had commercial value. The drilling was undertaken by S.A. Portland Cement Co. Ltd. (DSD report RB6400119) in two programs between 1966 and 1967. The drilling detected significant clay alteration up to 150m east of the historic workings and defined a white clay “volume” of 250,000 cubic yards. Soil sampling by Terramin has defined an outstanding copper in soil anomaly (+60ppm copper contours) coincident with a gravity low anomaly. The soil anomaly extends for more than 750m north-south and is up to 150m east-west. Several areas returned +1000ppm copper in soil with a peak result of 3239ppm copper. To date, in excess of 200 soil sites have been analysed with the HHXRF. Initial sample sites were nominally spaced at 20m on east-west lines 100m apart, followed by infill sampling down to 10m by 25m. Soil sample analyses were only collected from sites where the soil profile appeared to be undisturbed by historic mining. 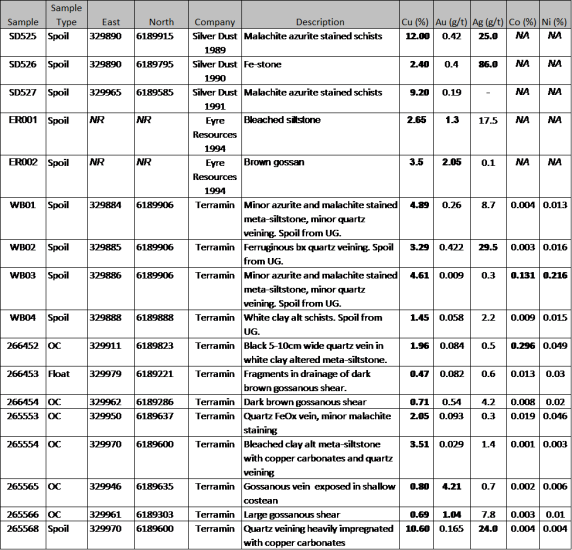 This was done to minimise analysing sites contaminated by past mining activity. The area covered by the sampling is shown on Figure 5. Areas of exceptionally high copper in soil anomalism are locally identifiable by stressed vegetation Figure 6. 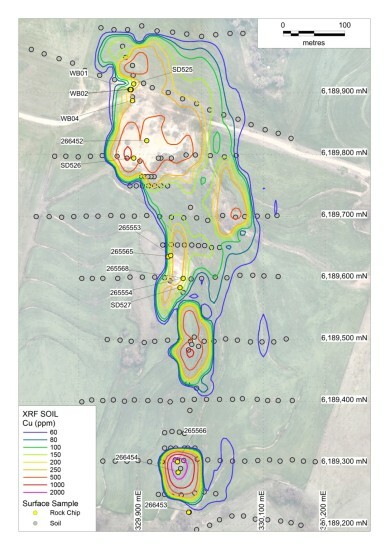 Figure 5 Surface sample and in situ soil analysis locations and contoured copper in soil results. Figure 6 Yellowed crop foliage defines zone of highly anomalous copper in soil. 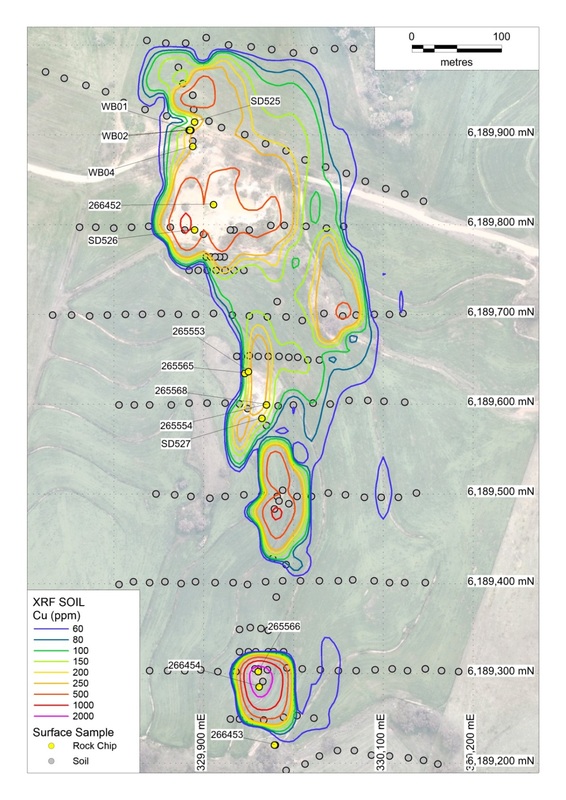 Figure 7 Gossanous sample location 265566, 1.04 g/t gold, 0.69% copper and 7.8 g/t silver. Rock chip samples were analysed at a laboratory to provide an understanding of the grade and geochemical associations of the gold mineralisation. The highest gold values (up to a peak value of 4.21g/t gold, sample 265565) are associated with gossanous veins and shear zones. Rock chip sample 265566 from the gossanous shear zone prominently exposed at the southern end of the prospect shown in Figure 7 returned a gold value of 1.04g/t. Peak values of 0.21% nickel (sample WB03) and 0.29% cobalt (sample 266452) from rock chips suggest a contribution from an unidentified mafic or ultramafic source. 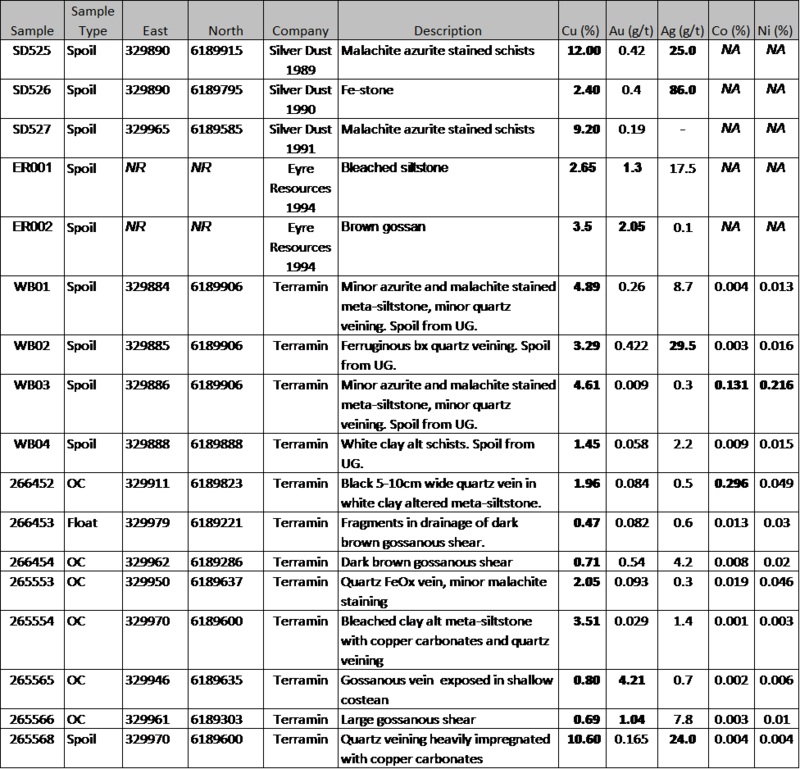 Table 1 Rock sample locations, descriptions and laboratory assay results (NR – not recorded, NA – not assayed), coordinates MGA Zone 54, GDA 94. The Wheal Barton copper-gold mineralisation occurs within the Carrickalinga Head Formation, a sequence of interbedded Cambrian sandstones and siltstones. The historically mined sections of Wheal Barton are located at a north-south sheared contact between outcropping hangingwall sandstone (west) and a recessive footwall meta-siltstone (east). 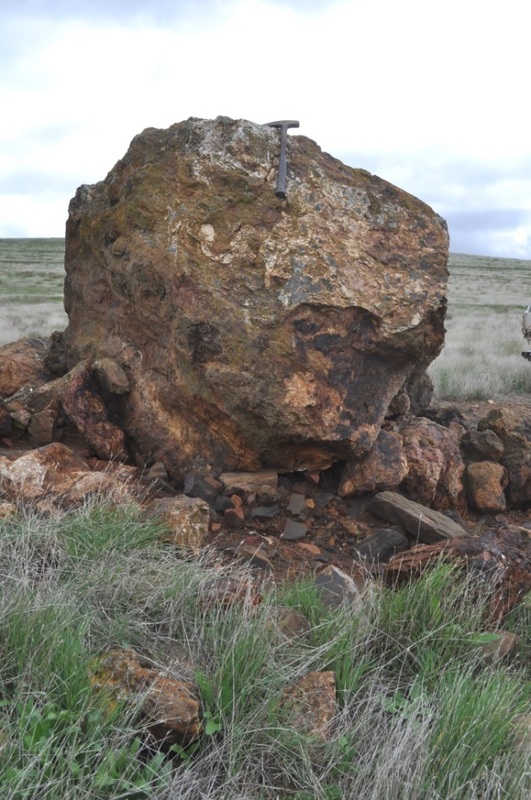 Historical Department of State Development (DSD) report RB0500159 suggests that copper-bearing ore was mined from veins 60 to120cm wide that averaged 20% copper, although one stope was recorded as having been 4.5m wide. There are good indications that the copper mineralisation extends well into the footwall. Spoil from the underground workings consisting of the white clay-altered siltstone consistently returns assays in excess of 1% copper. The clay alteration of the host rocks is best developed in the footwall siltstone, most likely the productof acid sulphate weathering during the Tertiary Period. Bleached and clay-altered siltstone is intermittently exposed up to 35m into the footwall of the historic workings in the walls of a dam excavated in the 1960’s to contain water pumped from the mine. 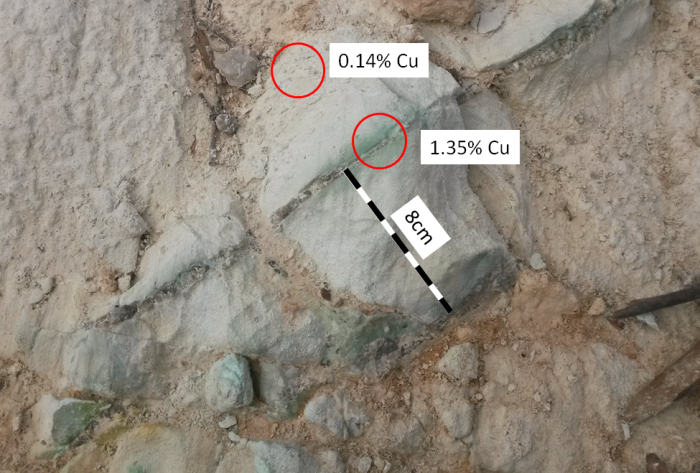 The dam walls reveal fine in-situ copper-bearing quartz veins suggesting that the primary copper mineralisation is at least 35m wide (Figure 8). HHXRF analyses of the siltstone exposed in the dam’s walls returned an average grade of 0.21% copper. However, at this stage it is unclear whether these results represent primary copper mineralisation, supergene enrichment, or are a result of copper-rich ground water having been pumped into the dam from the underground workings. Figure 8 Quartz veining with copper carbonates within bleached, clay-altered siltstone exposed in the wall of the mine de-watering dam (329927E 6189832N) showing spot HHXRF analysis locations and copper assays.